Pretty Pink Posh May Release Blog Hop. Welcome to Pretty Pink Posh’s May release blog hop. As you know, there are two new set of dies released beginning of this month. They are called Stitched Banner 2 dies and Stitched Borders 3 dies. And some beautiful sequin mixes called Enchanted Garden mixes and kit. And some really pretty iridescent sequins called Sunshine Glow, Peridot Mist, Lavender Moon and Strawberry Burst. Today, we are doing a blog hop showcasing the new products. You should have come from the gorgeous and talented Yuki Yoshioka‘s blog in the hop. But if you are here first, then don’t worry I will give you the list of designers towards the end of the post. Here is my card using dies from both the sets. Here is how my card came about. I chose the colours from the Enchanted Garden sequins mix. Then I wanted a layout for the card. Joni has started a new sketch challenge at Wplus9 and so I picked her sketch as the layout for my card. To participate in the sketch challenge, I picked Botanical Bunch stamp set from Wplus9 to use. Then I picked a technique to use. Watercolouring it was, Of course! Then looking at the Stitched Banner Duo 2 die, there is the banner and the small circle. So I thought if I spotlight the flower cluster image with the circle, it will awesome. So I stamped the flower cluster from Wplus9 stamp set in grey on the banner die cut and white embossed on watercolour paper to watercolour. I then die cut the three flowers out of the cluster using the circle die. I watercoloured the flower shading the colours from the Enchanted Garden sequins mix. Then brushed Wink of Stella shimmer. I then foam mounted this circle on the banner die using foam adhesive. So just the three coloured flowers are spotlighted. 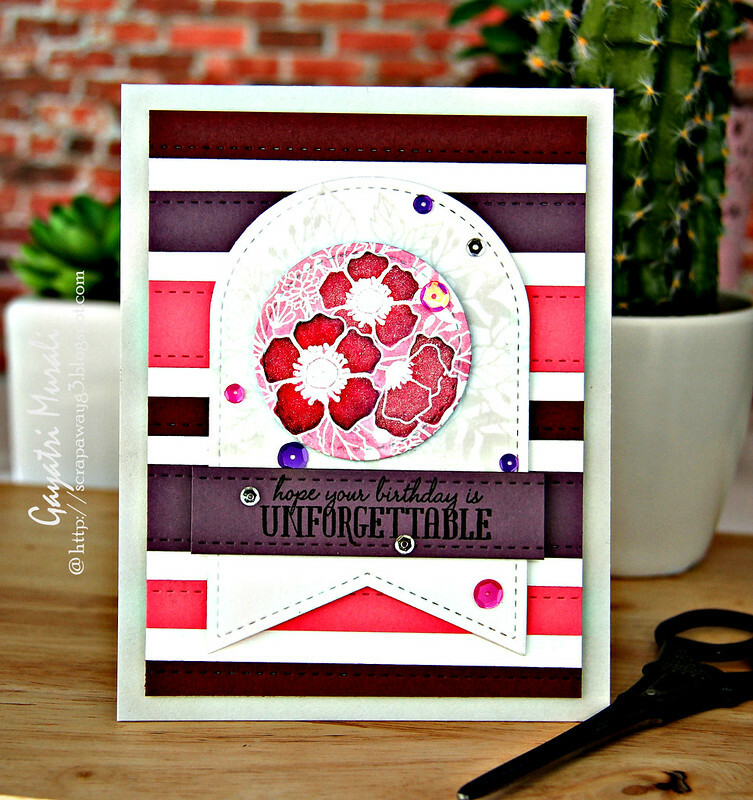 For the background I used the double stitched strip die from the Stitched Borders 3 die set and die cut three different shades of pink and purple. I wanted varied heights for the strips. So I kept some of them as is and trimmed a few others down to two different heights. Then glued down the strips on a white panel which is about 1/2′ smaller than the card front. I mounted the banner on the striped background panel using foam adhesives. Then mounted this entire panel on grey card base using foam adhesive again. For the sentiment, I stamped the sentiment from Wplus9 Unforgettable stamp set on one of the purple die cut strip to match and adhered on the tag. Finally I have used Enchanted Garden mix and Strawberry iridescent sequins to bring everything together. I am pretty pleased with how it turned out. Hope you do too. Now, Paulina is giving away two $25 gift certificates to two lucky winners. So please comment on all the blog in the hop because the winner will be chosen randomly from any of the blogs. Comemnts must be left bu 11.59PM PDT on 5/18/2015. Winner will be announced on Pretty Pink Posh’s Blog. Here is the list of designers participating in the blog hop. You next stop in the hop is to the very talented Nicole Gavaldon‘s blog. I saw the sneak peek of this card and couldn't wait to see the details. It is absolutely gorgeous! Thank you for sharing, and I look forward to trying out the design with the new PPP products! Wow! Your card is gorgeous! I love the shades of red and the flowers are beautiful. Sequins add so much to a card, I need lots of them. What a totally gorgeous card …Love it !!! Great colous, love how u used the dies…and who doesnt love sequins. Beautiful color palette, so striking, love your card design!!! What a clever use of the stitched border dies. I love that look. Also a fun take on the tag die. the shades of red on your card is awesome! love it. Love your card! The the enchanted garden mix! NIce card! Love the colors. Gorgeous card! First time I've seen this color combination and its beautiful!! Love your very colorful birthday card.Enchanted Garden sequins were pefect accents. Your card is absolutely gorgeous, LOVE it! Your card is sooo beautiful!!!! Those flowers look amazing and love the stripes! I like the layout to setup your card- great idea! What an awesome birthday card; the layout looks great with the colors in the background, and the flowers are gorgeous! Love the bold color stripes in the background! What a pretty card…full of deep rich colours! What a beautiful card and I really like that sketch! Definitely going to use it! Your card is very pretty!!! Love your color combo. Gorgeous card!! Love the rich colors! The middle looks like a stained glass window. Beautiful card. Love these bold colors, very striking card!! Oh that is sooo very pretty !!! Love the colors you used!!! Beautiful card. I love the colors. Thanks. Gayatri I immediately thought of the Wplus9 sketch when I saw Paulina's new banner die!!! So pretty, and perfect!! I can't get over how lovely these stitch dies are! Love the stitched border dies. Love, love, love these dies. You did an amazing job with your card. I really like the bold colors you used. Fantastic die use and the coloring is fantastic. I love your use of the banner die. It really looks so elegant! Beautiful card Gayatri. Love the pretty white embossed image and the coloring. The touch of sparkle looks wonderful. Beautiful! Love these new PPP products! Wow! LOVE your work and those colors are amazing! Such a pretty card! I love the new dies and sequins! Those stripes are a great background! Love your card! Such wonderful colours & I'm excited about the new dies! Awesome job. Great job on your card the color really stands out. Perfect sentiment for this card because the card is unforgettable too! Beautiful! What glorious, rich colours you used on this card and love the coloured strips across. Gorgeous flowers too!! Oh my! Such a striking card, and I love the colors! The new dies are awesome. Hi Gay! Absolutely STUNNING card and your choice of colors is absolutely perfect!!! Well done! So pretty!! Those strawberry sequins look scrumptious!! How lovely – your colors!!!! I would have never thought to use a deep plum color for the sentiment but it turned out divine! I love the colors of your card. Very pretty! Your card is very pretty with wonderful colors! Very bold card with the floral. what a stunner Gayatri. Gorgeous card. Such an elegant card! Like it a lot! I love every detail of your card!! the deep colors are so pretty for this card! I love wgat everyone has done with the new borders. I am huge on stripes. Wow – love your projects! What a beautiful card! I love the colors and just the overall design, great job! Loved the card! love the colors you used! I love the richness of your card! Beautiful! I love these bright beautiful blooms! Great card! What a beautiful card. I love the flowers…and the colors are marvelous. Great use of the dies and the sequins. A nice blog hop today. 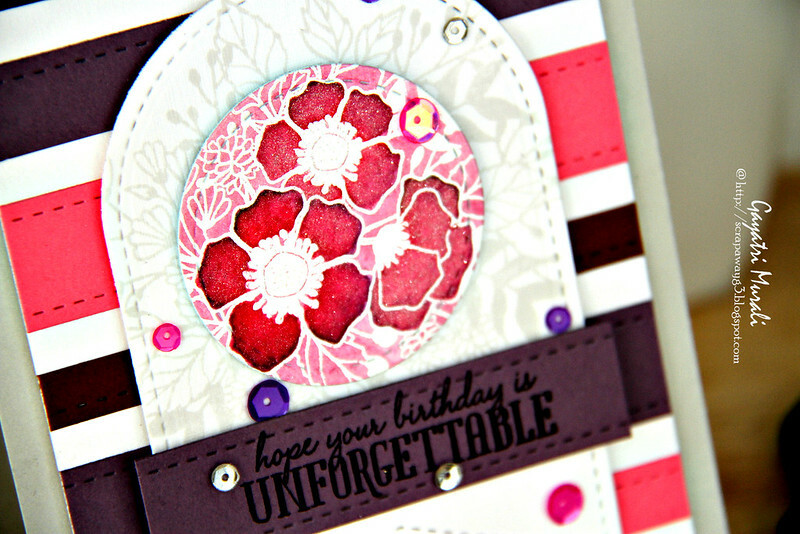 luv your colors and card design using the new PPP die. Your card is so beautiful. You have showcased the new dies beautifully !!! your card is stunner, is so beautiful, one of my favorites this day! What a different card! Very unique & lovely!! So very pretty!! The colors and design are awesome! Beautiful card, love the watercoloring and how the die showcases the flowers. Your colors are so amazing!!! Gorgeous!!!! Great use of the edge dies. Thanks for sharing ideas. Love your card. I like this new release also. There is so much you can do with it. Thanks for sharing. This is lovely!! I like the colors you used on this. You used the dies in a fabulous way! Great colors and I like the sketch. Pretty color combo! Love those awesome PPP dies! What a great use of a color combination… I love how the colors are bright yet serious! Thanks for a color palette inspiration! Such a pretty card! Love those dies too! this is so pretty, the color scheme is very eye catching on so many of your cards! Gorgeous card – love that rich red – sequins really beautiful on this card and design! FANTABULISCIOUSNESS! I am in love with this absolutely gorgeous creation! Everything about it makes my heart happy!! The colors, the strips, the die cutting! LOVELOVELOVE it!! TFS! Beautiful card and love your take on the sketch along with the new dies! These colors are so striking and bold, Gayatri! I love how you used these new dies from PPP. 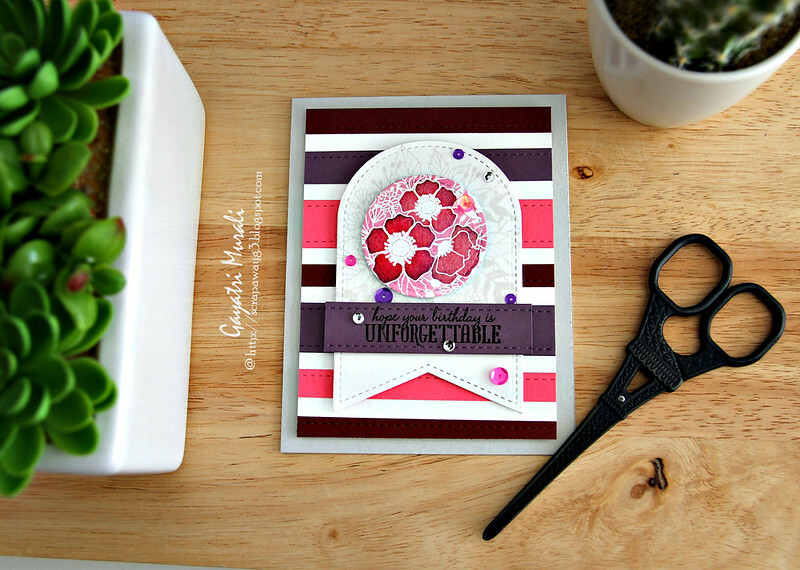 Thanks, Paulette S.
I love how you applied the stripes to your card–so beautiful! I love the stripes' colors and the quote on the card! The bold and colorful stripes are awesome!! !